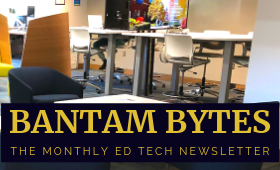 To add or alter the contents of a course, including adding activities or resources, a teacher must turn editing on. 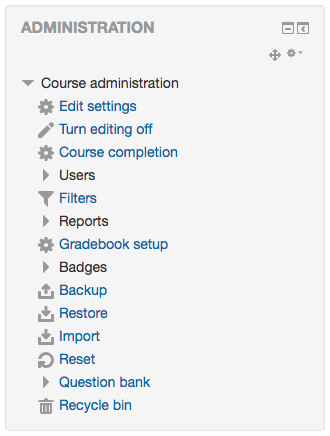 To do this, use the “Turn editing on” button located either at the top right of any course page when you’re logged in, or within the Administration block on the left, directly beneath Course Administration (as shown in the image on the left). This same button is also used to turn editing off when you are finished editing the course. 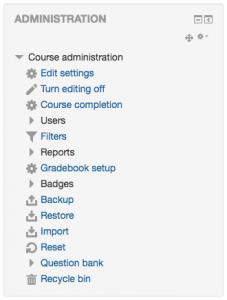 After editing is turned on, additional buttons will be noted in the course sections as shown in the screenshot below. The double-arrow icon in the upper left can be used to move the section to a different position in the course. The “Edit” button reveals a drop-down list of options that let you hide, delete, highlight, or edit the content of a topic. the link in the lower right allows you to add an activity or resource.